Not quite a bird, but this morning I have been tweeting up a storm! Recently I have been building a professional relationship with Carl Condliffe, an educator who is quickly becoming well known in the HPE field in NZ. He, along with many others have encouraged me to create a Twitter account to get my name out there. So, after weeks of deliberating whether I wanted another social media platform to get addicted to, not really sure what it is, I finally created one on Wednesday night! Little did I know - our focus for MDTA this morning was about Twitter and how tweeting can impact our Professional Learning Network! 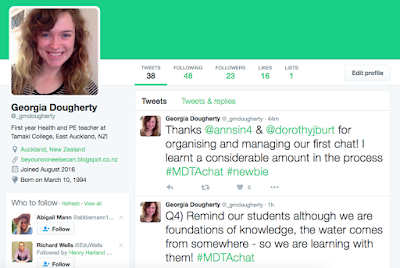 I can definitely see the value of Twitter as PD at my fingertips. I can access information from an array of professionals quite easily, and engage in 'chats' to develop my thinking as well as challenge others. 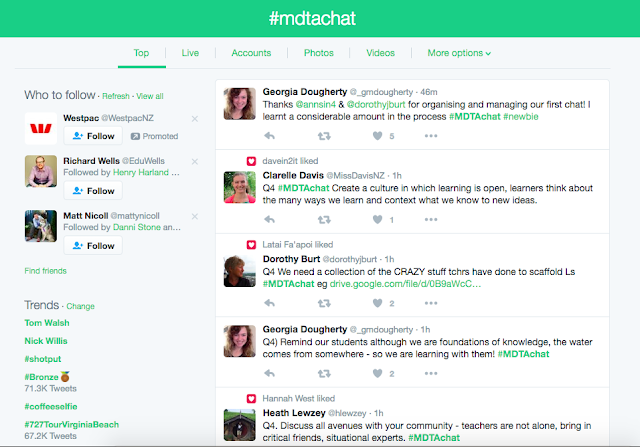 Our task today was to engage in one of these chats. We were provided with provocative questions in order to push our thinking outside of the box, and responded to the questions by tweeting. 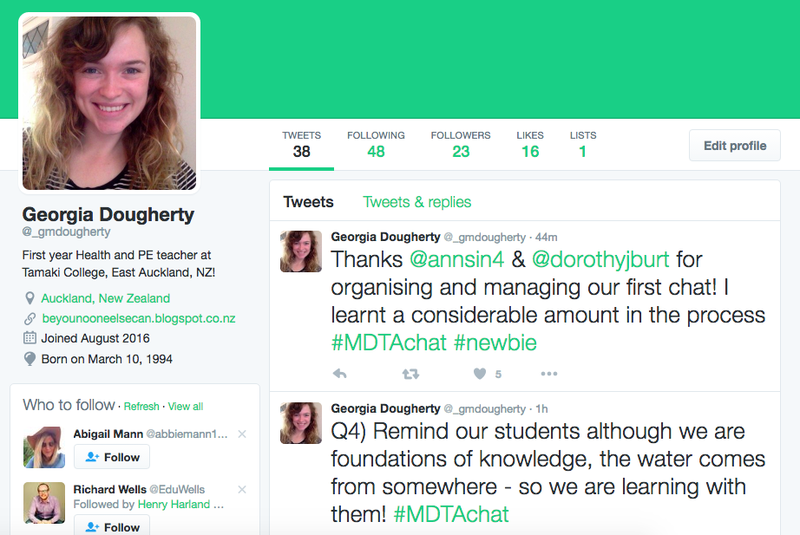 Our tweets included the hashtag #MDTAchat, so all responses were collated in one space. We were then encouraged to comment on our peers tweets to continue conversations and critically think further. Check out our chat here! I am definitely a newbie to Twitter, but I see the value it has. I enjoyed how this morning was about myself as a learner, as I feel sometimes I don't spend enough time developing myself as I am so focused on developing the students. I look forward to learning from and with others amongst this enormous professional networking medium!